Crunchy and tangy achari mathis - a perfect accompaniment with masala chai. 1. Mix all the ingredients together and make a stiff dough adding water as needed. 2. Take small marble sized portions and press with fingers or roll out into small thick roundels. 3. Heat oil in a pan. Reduce the flame and fry the methis to a light brown colour until crisp. When the mathis are done you will notice that they sink down in the pan. Drain them on a kitchen paper tissue. Store them in an air tight container when they are completely cold. 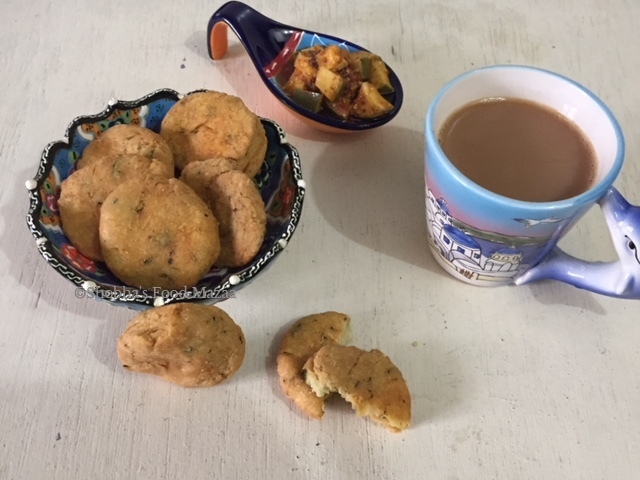 Definitely my kind of snacks, and that addition of achari masala and pickle makes this mathris more interesting and dangerously addictive. Yes Priya.. makes them flavourful. All yours dear.. Please do. Perfect tea time snack and that achari twist is lip smacking ! oh yumm shobhaji! mathri with pickle masala and mashed mango pickle, oh my i literally drooling as read the recipe!!! Looks fabulous, in another 10 days kids are going to start their summer vacation, this goes into their snack list noW, thanks for sharing!!! So glad you are going to make these for kids.. They will surely love the mathis. Love these snacks to munch with tea. Addition of achari masala must have given a nice taste to it. Yes Jayashree.. they come out so flavourful. Great way of using the pickle masala to spice up these crispy treats!! What a chatpata snack! Interesting way to use pickle. Nice. Lol.. Seema.. then you must make these for your family. Thanks dear.. they really are good for tea time. Love the flavor of achari masala in the mathris. They look so crispy and tasty. A different kind of mathi...adding achari masala and achar, must be so flavorful. Such an innovative recipe. Thanks for liking it Mayuri.. yes adding a little bit of pickle gives a nice tangy flavour.